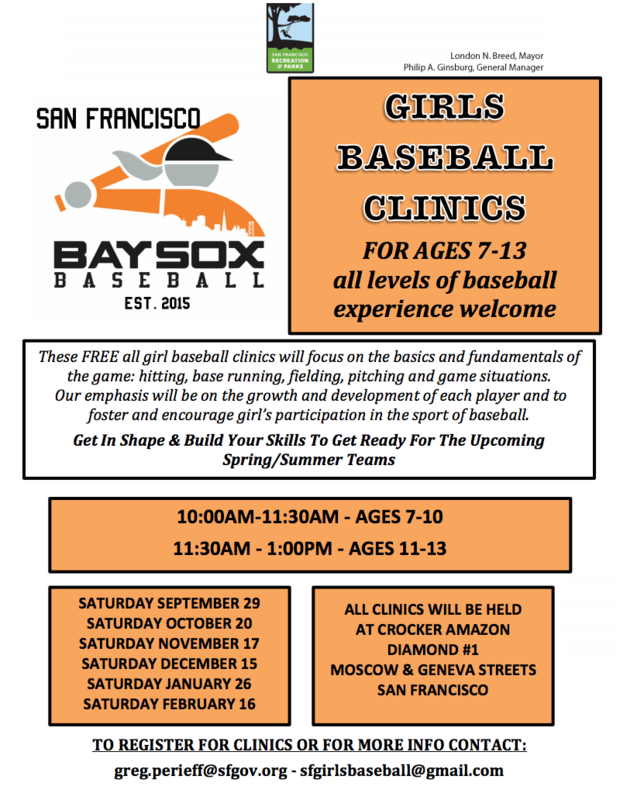 A project of the San Francisco Park & Rec Department, The San Francisco Bay Sox Girls Baseball Program is the largest girls baseball program currently operating in the US. Founded in 2015 by former Women's Baseball players Rachelle "Rocky" Henley and Alex Oglesby with the desire to field an all girls' team to represent San Francisco in the inaugural Baseball For All National Girls Baseball Tournament. The Bay Sox Program has grown to provide year-long developmental activities and teams and higher level travel teams for girls ages 6-18. Since it's inception, The Bay Sox has expanded from one team of 12 girls to serving over 80 girls annually with our clinics and teams, in our quest to show the world just how much the game of baseball needs women and girls. Bay Sox players have been chosen to participate in MLB's groundbreaking Trailblazer Series, our 13u Bay Sox team took 3rd place in the 2017 BFA Nationals and were honored with the tournament sportsmanship award and our 17U Bay Sox team brought home the championship wining 1st place in their division at 2017 BFA National Tournament. You may register online using the SFRPD system (links for each team provided below) - Please pay close attention to the division birthdays as the age range has changed for this season. Games for all teams will be on Saturdays (with 1-2 weekday games for Mustang & Bronco teams).